Tanita Corporation, the world’s leader in precision electronic scales introduces the HS-301 Solar Scale. This environmentally-conscious scale has built-in solar cells that draw power from sunlight or ordinary household light. There is never a need to buy or recharge batteries, making the HS-301 Solar Scale the perfect fit for health-minded consumers looking for products to complement their green home and lifestyle. Cost: $38.99 at the CompetitiveEdge.com. One of the most useless inventions ever, or is it? : Cooler Scoop. 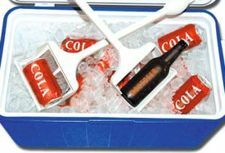 Cooler Scoop keeps hands from getting cold and wet when you go for that ice cold beverage. Prevents dirt and germ ridden hands from contaminating the ice in your cooler. Self-draining scoop also eliminates water from getting on floor. Features built-in bottle opener. It’s very special feeling to listen to music on a rainy day. Rain, it makes people sentimental. Especially listening to music under an umbrella with a person you love gives us big emotion. The dome structure of umbrellas allows sound to be more concentrated, and a handle of umbrella could be a great part for controlling the music. Sometimes people spin an umbrella unconsciously. If you spin this umbrella to left or right, the music will move forward (right turn) or reverse (left turn). Unfortunately even though it is not raining, you still can use this umbrella. You can just put it in the corner of your living room with cradle, and then also you can enjoy the music from speakers of cradle. The Instant FM USB Radio Recorder. Plug it into your USB port, tune it to your local FM or favorite web station and record stuff. Lots of stuff. Not only that, but this little doohickey will separate the tracks and identify songs using Snaptune. Then you can move it all onto your portable player. I can see this being pretty handy for Podcast fanatics somehow, although I’m not sure that it’s offering anything more than software only products like Station Ripper. More information after the jump. 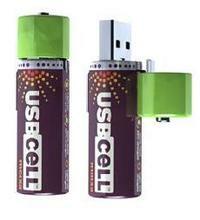 USBCells are AA batteries that can be recharged by plugging them into a USB port. They can also be charged in a standard charger. These cups are a must-have for any fan: X-3D Powercups. Here's an example for next's Monday Night Football game. Parrot, is introducing the NOMAD, the company’s latest hands-free speakerphone which offers wireless communication to cellphones via Bluetooth. The device functions as a hands-free car kit, clipping to the sun visor, however it can also be used as a speakerphone in your office or home. True to its name, the NOMAD will go just about anywhere, weighing around 100g (3.5oz) and 10 hours of talk time. The NOMAD also comes with voice recognition dialing, and a high quality 2watt speaker. "Parrot's latest product reproduces conversations in hands-free mode with listening quality worthy of a fully fitted kit. 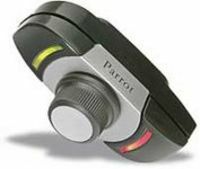 Parrot has also equipped the Parrot NOMAD with voice recognition. Featuring a higher level of quality than that of a phone, it can be used to call contacts via voice tags. Extremely easy to use, it clips to the sun visor... This kit will follow you everywhere. You can use this speakerphone alternately in the car, the office and at home." Pet Phone is not a phone for pets! 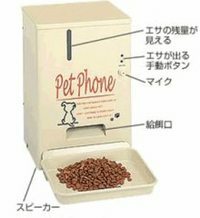 It's a container of pet food that can be operated through your cell phone. When you want to feed your dog or cat while you're away, you just push a couple of buttons on your cell and your Pet Phone will drop the necessary amount of food on the pet's plate. You can also talk to your pet through the speakers and your pet can respond to you through a microphone. 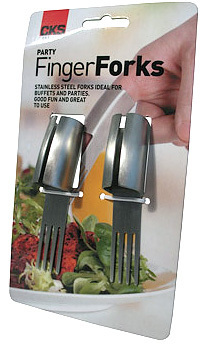 Sharp enough to pierce your food but not enough to skewer your other fingers: Party Finger Forks. No more sticky fingers! Feel like Edward Scissorhands as you stab at your party food delights. These stainless steel finger forks are ideal for buffets and parties. Good fun and great to use!